Main ApplicationsThis tape is suited for almost all indoor paint works. tesa® 4333 PV1 Precision Mask® Sensitive is applicable with water-based paints and lacquers and fits even for high-class spatula techniques. It is especially designed for applications on sensitive and critical surfaces. The flat backing material is highly conformable to the surface and leads to precise razor-sharp paint edges. 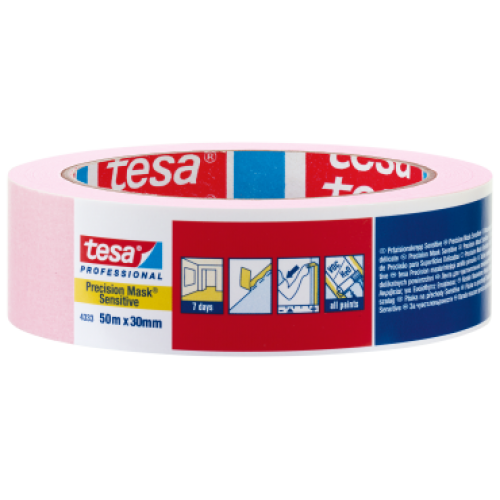 Tesa 4333 PV1 Precision Mask sensitive consists of an extra-thin and strong paper backing coated with a special acrylic adhesive.